On a day we had originally designated to being a lazy one, a solo Dutch traveler we met at our guest house convinced us to go inner tubing with her. We didn’t have anything better to do so we changed into our swimsuits and met up with Marijn in the restaurant lounge area, where the young local guys lazed about in the downtime when the tourists were all out hiking the jungles. When Putra — one of the intrepid jungle guides — came into the lounge with a guitar cradled in his arms, Marijn asked him to come along. He shrugged and agreed, put down his guitar and led us across the river to a small restaurant/inner tube rental shop where we rented two large inner tubes. There were no helmets or life jackets offered or even for rent, nor were there waivers to sign. But that was expected. We carried the inner tubes to the river below, and after we clumsily clambered on and situated ourselves inside, we pushed off. Carrying our tubes down to to the river. We immediately got wedged on some rocks in the river while Marijn and Putra drifted ahead of us. Putra noticed, jumped out of his inner tube and came to our rescue to pull us off and back onto the current. This was the first of many times he had to save us from something; there would be spiders, brambles hanging in the water, heavy machinery and more rocks coming up. 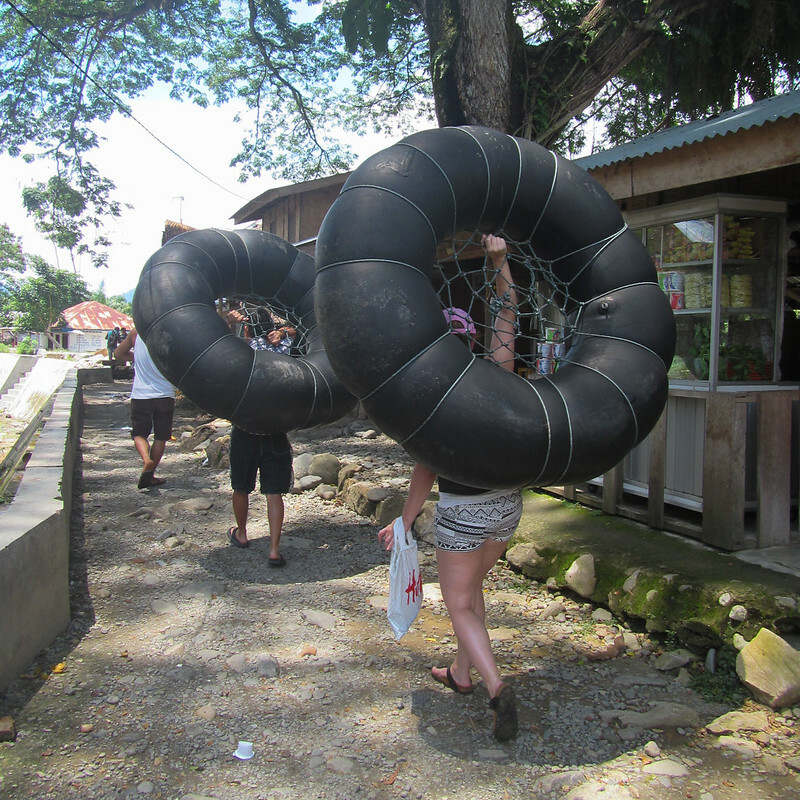 We didn’t have any string to tie the inner tubes together so we wouldn’t go drifting off again, so Putra held us together with his arms, all 90lbs of him. 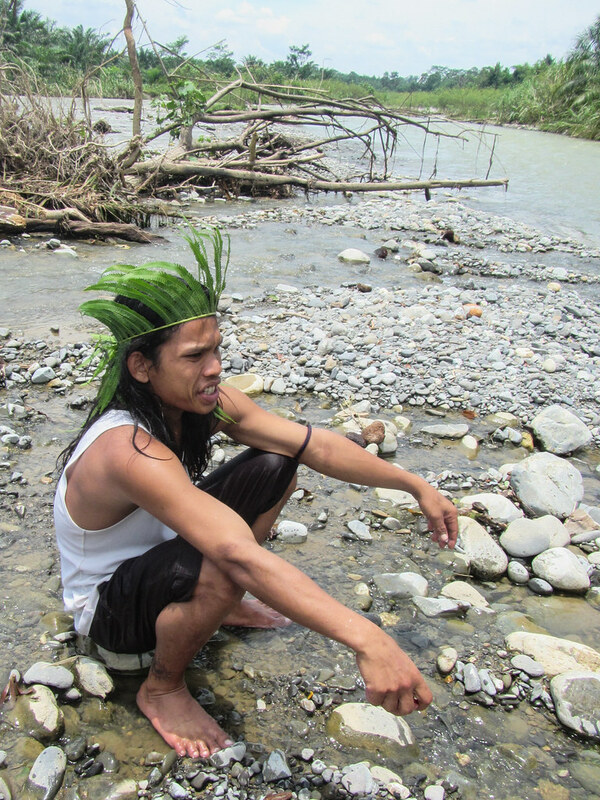 This was a guy who wrestled Mina — an aggressive female orangutan feared by all jungle guides for attacking humans — off of a tourist, and bears the scars from her bite marks on his arms. 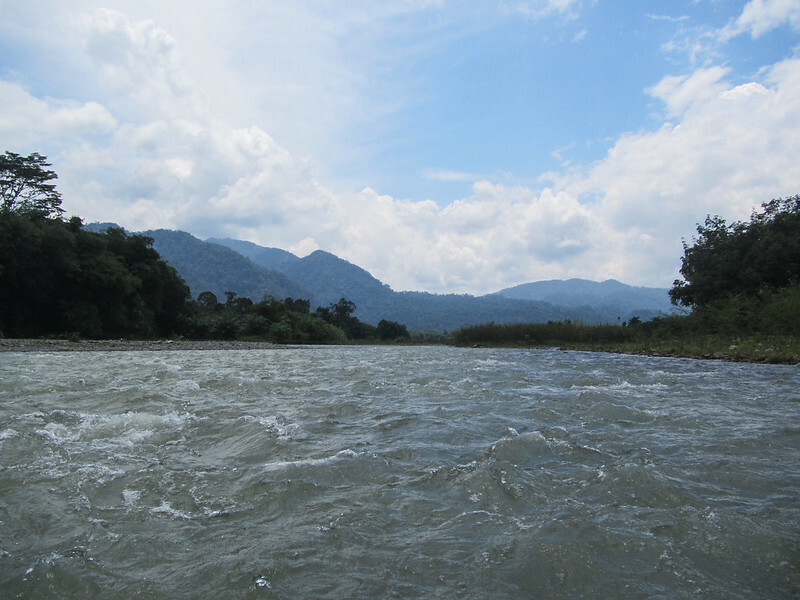 Drifting down the edge of Bukit Lawang. The tubes are large enough to fit two people snugly. Putra hanging onto our tube so we wouldn’t get separated again. The mountains in the distance, where the orangutan roam. Someone’s getting tired from having to babysit. It was a sunny afternoon, and the cool water felt amazing on our hot skin. We bounced along the shallow and light rapids and twirled around in the calmer waters, and got to a gravelly sandbar where we got out to take a rest. Well, more like to let poor Putra rest since he was doing all of the work. We sat on the tubes and talked with Marijn about her five-week travel plans in Indonesia while Putra smoked nearby, most likely regretting having agreed to come along with these useless tourists. Contemplating life without annoying tourists.